Grilled Turkey recipe? Yep! 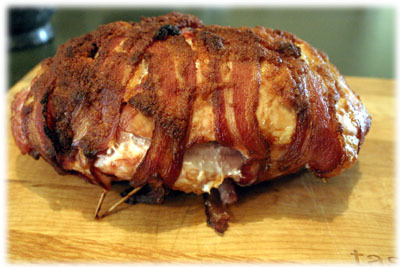 And not just any turkey, it's bacon-wrapped grilled turkey breasts. This poor bird has an unfair reputation for being dry. It's only dry if it's not cooked properly. While I always recommend using a flavored salt brine (click here to learn how to brine a turkey) it's not absolutely necessary with this recipe. Because we're wrapping the entire breasts with bacon they're self-basting as they cook. Just be sure to remove the grilled turkey when the internal temperature reaches 165F and cover with foil for 5 - 10 minutes before carving. Note: consider soaking the breasts in a brine overnight, see link above. 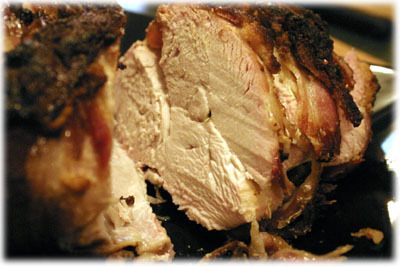 Select 2 boneless skinless turkey breasts, whatever size you want or enough to feed your guests (1/2 lb per person). 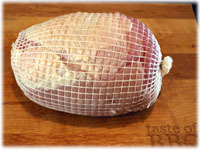 Occasionally you'll find packaged breasts like the one in the picture, wrapped in a mesh to keep them together. For this grilled turkey recipe we cut off the mesh. 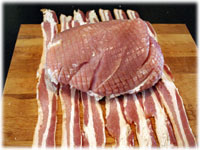 Lay the bacon strips on your work surface and place the turkey breasts on top of the bacon. 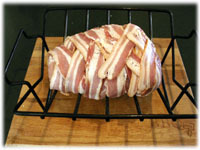 Pull each end of the bacon strips up and over the turkey breasts. If need be secure the strips to the turkey with toothpicks, just remember to remove the toothpicks after cooking and before serving. If you have a roast rack for your BBQ it comes in very handy. 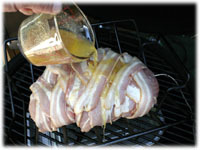 Otherwise it's ok to just set this bacon wrapped bird of paradise directly on the bbq grates over a pan of water. Preheat your barbecue to 400F - 450F and set up for indirect cooking by placing a pan of water under the grates where the grilled turkey breast will be sitting. Melt the butter (I use a small glass measuring cup and microwave) and stir in the garlic powder. 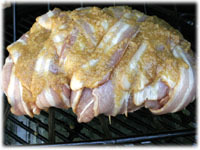 Place the turkey on the bbq and pour the butter-garlic mixture over the bacon. 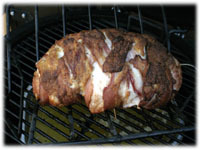 Make sure you've a cooking thermometer inserted into the center of the meat and close the lid. When it reaches this temperature remove from the grill and wrap in aluminum foil for 5 - 10 minutes before carving.